When covering an event (e.g. a wedding) using multiple cameras it is difficult to display the photos in the order in which they were taken unless the time and date settings on the cameras are sychronized beforehand. In theory it is easy to ensure the clocks on the cameras are synchonized but in practice this isn't always possible e.g. the time may be set incorrectly on one camera, the clocks on the cameras aren't very accurate and tend to drift apart, changing time zones may result in one camera being updated and another not. 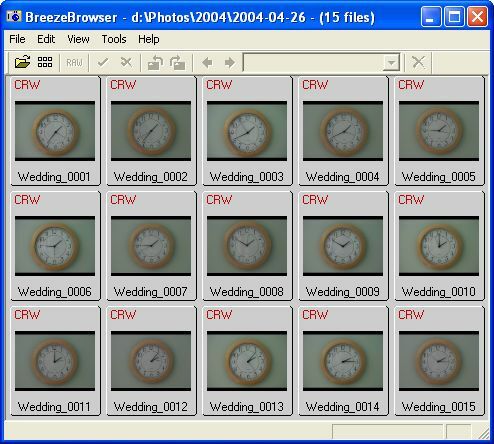 This article describes a method for using Downloader Pro and BreezeBrowser Pro (or BreezeBrowser) to sychronize shots from multiple cameras after the pictures have been taken. Take a shot of the same clock using each camera to provide a reference time (this can be before, during or after the event). Please note: Always take a backup copy of your images before modifying them so that if you make any mistakes you can go back to the original, unmodified images. The easiest way to describe this technique is by using an example. 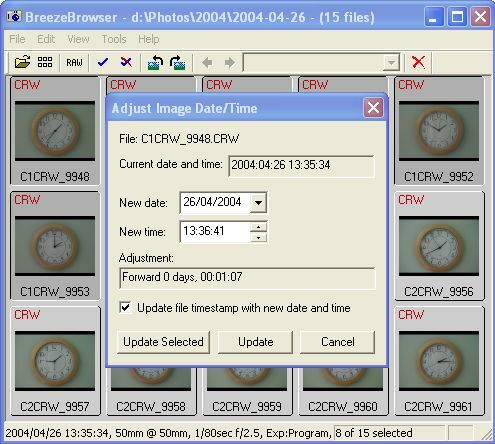 For this example the clocks on a Canon EOS 10D and Canon EOS 300D were deliberately set to different times and a series of pictures of a clock were taken with both cameras. The screenshot below shows the unadjusted images sorted by the camera's timestamp and it can be seen that they are not in chronological order e.g. C2CRW_9955 is displayed after C1CRW_9952 even though it was taken nearly 15 minutes earlier. Before, during or after the event take a picture of the same clock using each camera. This will provide a reference time for the event and makes it much easier to sychronize the images later. In this example the camera model name and serial number from each camera are used to prefix the image filenames with "C1" for the Canon EOS 10D and "C2" for the Canon EOS 300D. Some cameras, e.g. Canon PowerShot cameras, can store an "owner string" in the image shooting data and the camera mapping function can use this if the camera serial number isn't available. Other cameras, e.g. Nikon digital SLRs, can store a user comment in the shooting data of each image. If you are using the camera "owner string" or the image user comment you need to use a different value in each camera so that Downloader Pro can tell them apart. The filename in the "Download Path" is set to %T8%o to prefix the original filename with "C1" or "C2" from the camera mapping. Then all the images from the event into the same directory. In BreezeBrowser display the images in thumbnail mode and set the viewing order to "Sort alphabetically" (View menu, Image order) so that all the shots from each camera are grouped together. Select all the images from one camera and select "Adjust Image Date/Time..." from the Tools menu. Set the "New time" to the time shown on the clock in the picture and press the "Update selected" button to apply the same correction to all the selected images. The images from the first camera should now be sychronized to the "event time". Repeat the same procedure for the images from each of the other cameras and then set the image order to "Sort by timestamp" to display the images in the order in which they were shot.